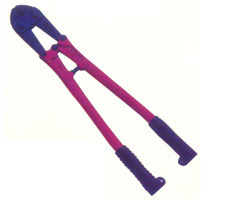 We are one of the leading names in the field of offering a wide variety of Bolt Cutters. Delivering durable working in given usage applications, these are made available by us in different model options top choose from. The models include HO-1012 in lengths of 300mm (12"), HO-1014 in lengths of 350mm (14"), HO-1018 in lengths of 450mm (18"), HO-41024 in lengths of 600mm (24"), HO-1036 in lengths of 900mm (36") and HO-41042 in lengths of 1050mm (42").